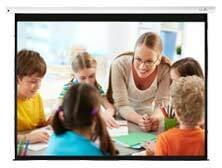 Before you can choose the perfect electric projector screen for your installation, you have to match the aspect ratio of the screen to the aspect ratio or resolution of your projector. This ensures the projected image is the perfect fit for your new screen and maximises the image size. You'll get the best results as your image will reach the high-contrast black edges of the screen - rather than surrounding the image with white space. If you're unsure of which to choose, call our friendly electric projector screen experts on 08000730833 and we can discuss your projector model and installation requirements. We'll help you get the perfect electric projector screen.